Line up for judgment, boys. SPOILER: There will be some yelling involved. As per the usual, we’re not entirely sure what the hell is going on with his pants, but we have to applaud him for finally listening to us and getting them hemmed to a correct length. If you insist on wearing lifts (which, by the way, tend to give you toddler feet from straight on), then you really have to make sure there aren’t puddles of fabric at your feet because all it’s going to do is drive the eye straight to your secret shame. And speaking of puddles of fabric, this looks awful. The suit’s too boxy and the pants are both too wide and too long. He looks like he’s wearing his big brother’s suit. Plain, but nicely fitted. We can’t hate, even if it’s a little dull. 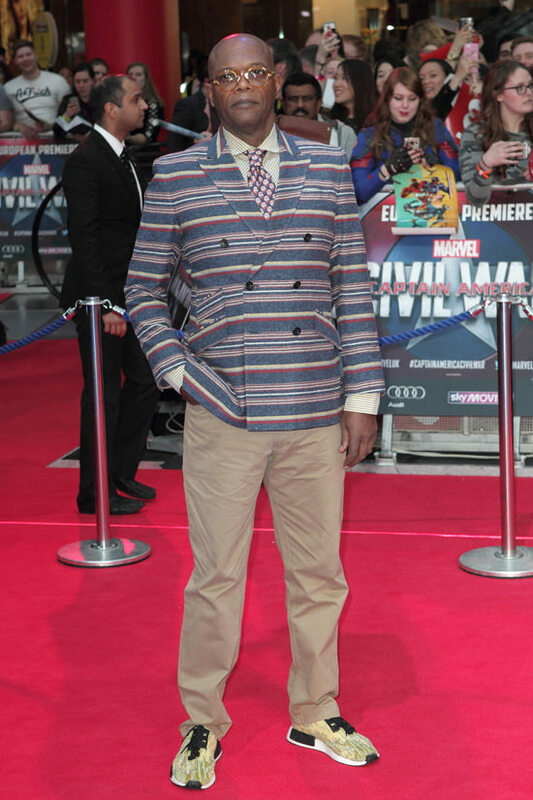 We love this, but only because Samuel L. Jackson is wearing it. All other human males are advised not to try this. Flawless. Love that he wore red, white and blue. There are things here we should probably rail against – like the black pants paired with a blue sportscoat and off-black shoes, not to mention the Amish neckline – but if you’re thin, young and cute, most of these things either don’t detract from the look or wind up making it. In other words, we really like this, but we probably wouldn’t on a different person. He looks cute. Can’t really argue with that. We have to say, we’re really digging Bulked Up Paul Rudman. We’re not a hundred percent on the beard, though. He can keep it, but he should probably trim it. We like the color scheme here. Not many men would wear taupe, green, blue and purple all in one outfit. And almost no men could really pull it off. Except for Anthony Mackie, we’re pretty i,pressed with the suiting in this group. It all looks well-fitted and high end. Love the suit (he’s the right build for a double-breasted skinny suit) and the obnoxious shades, but this really needed a tie.